253-841-5457 www.puyallupparksandrec.com Partnership Opportunities — There are many different ways your business can partner with us through the many activities, events and sports we offer to the community. Ranging from the popular concert series, to supporting the youth scholarship program to sponsoring a youth sports team there is something for all sizes of companies and organizations. To learn more about partnering with us contact Deon Moyd at 253-841-5457. There is going to be so much to do this summer for kids 3-13 years old. Registration opens April 8. 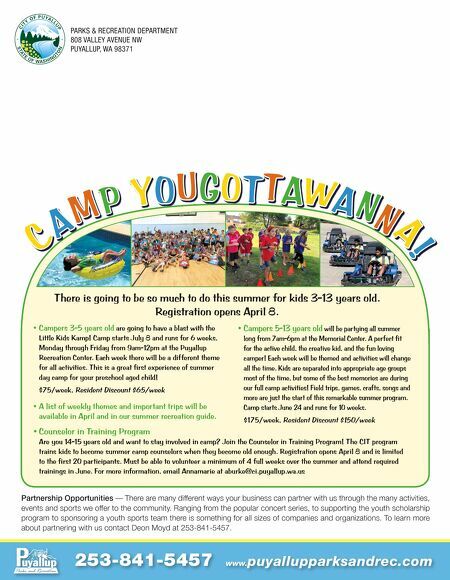 • Campers 3-5 years old are going to have a blast with the Little Kids Kamp! Camp starts July 8 and runs for 6 weeks, Monday through Friday from 9am-12pm at the Puyallup Recreation Center. Each week there will be a different theme for all activities. This is a great first experience of summer day camp for your preschool aged child! $75/week, Resident Discount $65/week • Campers 5-13 years old will be partying all summer long from 7am-6pm at the Memorial Center. A perfect fit for the active child, the creative kid, and the fun loving camper! Each week will be themed and activities will change all the time. Kids are separated into appropriate age groups most of the time, but some of the best memories are during our full camp activities! Field trips, games, crafts, songs and more are just the start of this remarkable summer program. Camp starts June 24 and runs for 10 weeks. $175/week, Resident Discount $150/week • A list of weekly themes and important trips will be available in April and in our summer recreation guide. • Counselor in Training Program Are you 14-15 years old and want to stay involved in camp? Join the Counselor in Training Program! The CIT program trains kids to become summer camp counselors when they become old enough. Registration opens April 8 and is limited to the first 20 participants. Must be able to volunteer a minimum of 4 full weeks over the summer and attend required trainings in June. For more information, email Annamarie at aburke@ci.puyallup.wa.us PARKS & RECREATION DEPARTMENT 808 VALLEY AVENUE NW PUYALLUP, WA 98371 C A M P Y O U GO T T A W A N N A !